So today I woke up early and got my bum out the door. It was cardio day and I was on a mission! Today I ran/walked 62 minutes!!! I've run two marathons in my life and a third one is on my horizon. I've always wanted to run the Disney Marathon . Anyway, I ran and I walked and I had a blast! I must have shed at least a pound or two :). "One of the interesting contradictions of life is that we want to change, and yet at some level, we want to stay the same. But you can't do both. You have to want change more than you want to stay the same..."
I know I'm at that point where I do want that change. I've come so far...this morning during my leg workout I took time to write down what has changed about me in the last 6 weeks. Here ya' go. 1) Activities are now revolving around the people, the event and not the food. 4) My blood sugar is more even throughout the day. Hardly any of those highs and lows. I rarely eat or crave sugar these days!! 5) I'm not tempted by foods and on those rare occasions I am I just think about my nice, lean waist I'm after. 7) less head and neck aches!! 13) Seeing definition in my legs for the first time in years!! 7) Remember the American Idol Concert on August 29th and the shirt I bought that I so want to be able to wear!!! Just found out my dear friend Kristen will be starting the Challenge soon. I am so excited for her and me so we can cheer each other on!!!! Oh, one more thing...I've decided to go a bit different with my Blog colors and layout. I am so loving this summery feel. Make it a great day...oh, be sure and head over to Scrapwords this week. New Chatterbox will be coming in this week!!! Okay, so my Blog isn't finished yet but it's getting there. Been having fun putting my fave links back on, playing with the colors and fonts, etc. I hope to have it all back to normal by Monday. OKay, so my Blog still looks WEIRD and it is all my fault!! UGH! I was trying to do something cool and artsy with it and I erased all my stuff, messed up the whole look of it!! For now it will look this way until I decide what I'm gonna do with it. Thought I'd still keep you updated on my BFL experience. I'm nearing the end of Week 5. Can't believe it. My waist keeps shrinking, my legs have definition and I just feel "tighter" everywhere. I'm still not excited about how my pants fit. Nothing major happening there but I just gotta stay the course!! As of this morning I think I've lost one more pound. Since January I've lost 7 and since the Challenge I've lost 3. See, nothing major but the fat is melting off my body so I should begin seeing changes in the scale and my clothing soon! Today I power walked nearly 50 minutes. Enjoying being outside for these walks. They energize me. I've been sick lately and today I'm really sick. Sore throat, headache...I just don't feel good. Stop by Scrapwords today and check out this weekend's challenge. You can win $10 to use in the store!!! Why not take a part of your day and head over to my site Scrapwords? This week we are focusing on Ali Edwards' mantra "It is okay...". Love that! With a gazillion and one things to do this week and with taking the day off yesterday because of a cold I keep repeating to myself "It is okay...". In case you didn't know we try to take one word or one phrase and focus on that for 7 days. During and after that week you can write in your journal how, by focusing on that one particular saying/word, it helped you get through a difficult time, helped you remain sane and productive for the week...or whatever. I am a big fan of Ali's work and philosophy. She inspires me daily. Be sure and check out her blog here. Feeling fabulous and back on track with my Challenge. Tummy flatter, legs stronger, back and shoulders firmer. I'm to do my cardio. Have a wonderful Wednesday. It's after 1:00 in the afternoon here and I'm just now getting around for the day. I'm feeling a bit "off" today. Ever have one of those days?? I'm really, really tired and don't feel good. Think I'm coming down with a cold...sore throat and everything. I'm off to check on Scrapwords...I'm usually on first thing after my shower...but like I said I had a super late start to my day. As you can tell from my title...I've got lots to talk about!! Just got back from CHA-Chicago. WOW, what fun we had!! Here are some highlights...That's me with one of my favorite scrappers EVER Ali Edwards!! I was one of the first people in line to meet her. She is soooo fun. She gave me a copy of her latest book on mini albums (not even released in stores yet). So cool and a great book!! The next photo is Meg and I with the founder of Chatterbox Melody Ross. I have been a fan of this lady for years. When she was just starting out I actually visited with her over the phone. It has been neat seeing her become so successful. Plus she is as nice in person as I imagined. I picked up lots of Chatterbox for the Scrapwords store!! Here is one of my favorite photos from the weekend...me and my cousin Missy at Gibson's Steakhouse in Chicago. We had a blast!! I am sooooo loving these acrylic 12x12 shaped pages from Clearscraps. I picked up several for the Scrapwords store. They should be in stock in just a few weeks!! Okay, this company was one of my faves of the weekend "Webster's Pages". Just look at these luscious papers!!! I picked up most of these plus journaling tags, Christmas papers and one calendar page. The possibilities are endless here!! Okay, enough of CHA for a moment. Today is the beginning of Week 5 of the Body For Life Challenge. I am proud to say that last week I did not miss one workout!! From Thursday through Sunday my eating was not the plan (so many good foods in Chicago) but it wasn't just a free for all either. I did use restraint!! LOL! This weekend taught me that eating clean is as important for my body as my spirit. It was fun eating some "forbidden" foods but I'm back on plan and ready to drop some more inches!! I woke up this morning with a tall glass of ice water, an EAS protein bar and a brisk 40 minute walk. I'm gonna make Week 5 COUNT!!! Woke up this morning sore and tired. Also have a migraine "simmering". But I got up anyway, put my tennis shoes on and got out the door. It's cardio day and I don't want to blow it. My main goal for 12 weeks has been the same...DON'T MISS A WORKOUT! I haven't yet and I'm not going to. Tomorrow I'll do double workouts before boarding my plane to Chicago. My flight leaves at 2:55. I am sooooo excited to have a girls only weekend!!!! Bill Phillips says the heart of Body for Life is developing self-trust. He's right. I've got to trust myself to not miss a workout. I've got to trust myself that I won't pig out on crap. I've got to trust myself that I am going to follow through with this challenge and become a force to be reckoned with! I woke up this morning with the flattest tummy I've had in YEARS!! My waist is shrinking, too. Tried on a pair of size 10 jeans...they not only fit nicely but I can see where they'll soon be too big around the waist!! I'm gonna wear these to Chicago!! Oh, speaking of Chicago...that's where I'm headed in just 2 days!! Going to the big Craft and Hobby Show for Scrapwords. Can't wait! I have been doubling my workouts up so I can have two days without working out. I know eating will be a bit of a challenge so I'm bringing my own meal replacement bars, snacks and saving up for 3 nights of interesting Chicago food. the Monday after we got home. I remember being committed, determined and scared. I had started so many weight loss programs this past year without one success. I'd go strong for 2 or 3 days then fall right back into my old habits. Now here I am in WEEK 4!!! I haven't missed one workout, I'm eating healthy, not giving in to junk food, taking this seriously and being successful. I keep thinking if I've changed this much mentally in 4 weeks I can't imagine what I'll feel by September!! "For some people, especially women, any recognizable physical changes may take between 6 and 8 weeks. People who've been making little or no progress wake up one day in Week 8 to discover something astonishing: The long-awaited transformation has begun. Their bodies are changing. Their fat is beginning to disappear. Their muscles are beginning to show. Their clothes no longer fit. It's as if a switch has been thrown. It's when your body, after weeks of stubborn resistance, not only surrenders but eagerly embraces your transformation." The old me would have quit by now. I mean the scale isn't moving so this isn't working right? Okay, so the scale isn't moving like I'd like...but my clothes are fitting better, in fact they are beginning to get loose. I have more energy, I'm not craving sweets, my upper body and head pain is diminshing...this program is working and the above paragraph assures me that I will begin seeing major results very soon!! -my headaches and neck pain has dropped dramatically!! -still drinking one Diet Coke a day...still would like to stop this. -I'm actually doing this. I am committed. I am not going to quit this time!! -I haven't missed one workout!! I'll post more tomorrow. Happy Sunday! 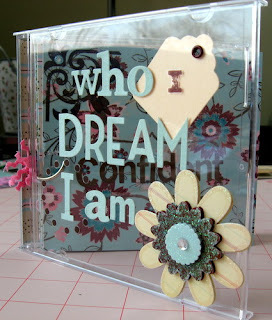 Check out this inspiring acrylic mini album from Scrapwords Wordsmith Becca. She is soooo talented!! If you'd like to find inspiration just like this be sure and stop our first ever *official* on-line crop at Scrapwords. We'll scrap Saturday, July 12th from9 am to 9 pm and enjoy challenges from the talented Wordsmiths. PLUS you can win $75 worth of scrappy supplies and get the "Queen of the Crop" blinkie!!!! I've turned a corner. I'm really into this Challenge, weightlifting, drinking my EAS shakes, no junk food, etc. I mean I AM INTO THIS!! Today I used a 12 pound weight for my triceps!!! I am in shock. At the beginning of Week 1 I was struggling to lift 8 pounds. I had the best upper body workout today...I just feel stronger, more confident, like this is really working...this is really happening. I could actually look like one of the "after" pics!!! Blend together, serve in tall glass with 1 dollop of frozen fat free cool whip. Yum-O! I did a lot of thinking during my walk this morning. It's a beautiful, hot, muggy morning in Missouri...I love that!! Reminds me of my lazy days in Iowa during my childhood...anyway...I was thinking about my plan and realized this is the first time in years I haven't even been tempted to cheat. Not once! And it's Day 17!!! Oh, sure I've thought things like "I'm so hungry, more food sounds good" but even though I'm thinking that I'm not doing that. I don't even think about actually doing it...know what I mean? I forgot to post on Monday that I had a super cool thing happen to me...I actually was using 12 pound weights!! This is huge for me. I injured my neck years ago and have lots of pain with that. Haven't been able to even really lift much past a 5 pound weight. But...I told myself I would get past that pain, improve my neck strength and finish this challenge weights and all. So now look at me just after 2 weeks I'm beyond anything I ever imagined!! I am just so pleased with that! "Reading your goals every morning and night will help you stay on course. Committing your goals to memory helps even more as it harnesses the power of a part of your mind called the "frontal cortex". Quite simply, the frontal cortex is a guidance system that directs your concious and subconscious thoughts, patterns and actions. When your mind is focused on achieving specific goals, you will notice reduced stress and increased clarity, satisfaction, and peace of mind." I guess it would be pretty easy for me to get frustrated and want to quit right now. I haven't lost any significant weight, I'm not wearing a size smaller and my fat is still there (LOL!). However, everything I read about this Challenge assures me that if I stay the course, eat right, exercise and all that I will see results in week 6 - 8. So, I'm staying the course, I'm not giving in and I'm gonna look at those goals DAILY! **BTW, I will share my goals with you tomorrow. What a great weekend!! We left Friday morning (the 4th of July) for my hometown of Fort Madison. We got there around 2:30 in the afternoon and headed straight for one of our favorite restaurants The Parthenon. I knew that this would be my FREE DAY on the plan so I indulged in a plate of hot, crispy fries and a tenderloin...finished it off with a small vanilla cone. **Just so you know it was a real challenge eating today. Even though it was my free day I didn't want to have a free for all type of day. It ended up okay. Saturday proved to be the hardest regarding my Challenge. We headed over to Carthage, Illinois for the Kern Family Reunion. We had not all been together since I was 10 or 11 so this was a real treat!! I knew there would be food and for me food, fun and family all go hand in hand. I had decided earlier in the week I would focus on the people rather than the food. For the most part this worked! So while I came away eating more off plan than on and honestly taking another FREE DAY for the week I did so much better than I would have in the past. I consider that a victory over making food the priority rather than the reunion. **Check out all the fun reunion photos at the top of this post!!! The top photo is of me with my cousins...Andy is on the left and Dale is on the right. We were all born in a row in 1966...August, September and October!! Throughout our childhood we were called the Three Muskateers and were never apart during family gatherings. I hadn't seen Andy in 6 or 7 years...we had such a blast!! The next photo is most everyone that came to the reunion. The third photo is my cousin Dale's wife Missy. We are very good friends and I am so blessed she is my family, too. She is my Design Team Queen on Scrapwords. The fourth photo is me and Dale off on a motorcycle adventure. I was scared here...but it turned out to be fun!! What I learned this past week being on the Challenge and traveling is it is hard, you have to plan and keep up with your workouts!! I worked out Saturday morning in the hotel gym. I did 40 minutes of high intensity cardio on the treadmill...felt GREAT!! Also be sure and pack clean eating food. I didn't do that...so it was easier to not stay on plan. I have learned my lesson. **The number one thing I learned while gone this weekend is that I AM committed to finishing the Challenge. It would have been so easy for me to just pig-out and say...oh, what the heck. But I didn't and I got right back into this morning doing my upper body workout as well as 28 minutes of cardio. I am going to post a Week 3 photo of myself this Friday. This will give me an incentive to keep eating clean!! Hey, girls!! I'm in the mood to SCRAP, CREATE and WIN!!! Saturday, July 12 from 10 am to 10 pm join us here at Scrapwords for a fun Summer Crop!! Our theme this month is Finding and Embracing Your Style so you can expect cool challenges to hel pyou do just that!! Join us every hour for different challenges, cool prizes and maybe even a few surprises! Our BIGGIE prize of the weekend will be a $75 prize pack!! Holy Cow! Come on and let's have some fun!! Invite your friends over, pull out your scrap stuff, snacks and SCRAP! Be sure and keep your computer handy for more inspirational than you can imagine!!! Be sure and check back next week for more details!! Mark your calendars and I hope to see you there!! My stomach is getting flat! I can see a faint outline of my obliques! This is really happening...I am doing this!! Be sure and check out Scrapwords for the new July Kit "Perfectly Clear". If you like clear albums that are all the rage right now this kit is for you!! **Just got done doing my upper body today. Can't believe how much stronger I am! On another note...while my tummy is definitely getting flatter...my lower tummy is not. Tried on some pants today with hopes they'd be comfortable...they weren't. Must be patient!! I know if I stay the course on this plan I will see results! WOW! I feel so alive. Just finished 41 minutes of intense cardio outside. Loved it!! I forgot how good it feels to be outside when I'm working hard. What a perfect start to my day. Phillips says this... "No matter who you are, this much I promise: YOU have the power to change!" Think about that. He doesn't say "I have the power to change you." But rather "YOU have the power to change YOU." How many times have we spent money on some new gadget, book or DVD hoping "it" will change us, help us lose weight, break a bad habit or whatever. This is what I love about the BFL program...it empowers YOU. Another thought from Phillips..."Sometimes you may feel as if you're having a tug of war between your old self and your new self. It's not easy to make the type of changes in your life that you've decided to make. In your moments of decision, when you feel like eating ice cream at night or don't want to work out in the morning, ask yourself this, "Who do I want to be today: the old me or the new me?" Your body and your life are being shaped by these moment-to-moment decisions. It's those decisions that brought you to where you were at the beginning of this Program. And if you continue to make decisions the old way, you're going to continue to produce the same results. To create different results, you have to take a different approach. It's not easy to stand up to yourself, but you can do it!" I read this yesterday and it put everything in perspective. In the past I would start a diet, a plan, whatever...go great guns for a week then we'd go to my favorite restaurant, a movie or make cookies and I'd just go off plan, telling myself I deserved because I'd been so good. Like Bill says it's those moment-to-moment decisions that matter...they shape us. They reveal who we are and what we want. I've decided that this is my moment. My moment to be true to myself, to give it my all, to change.